This is a repost from a blog entry to the Writer's Grapevine, December of 2011. That year, a group of us invited guest authors to post Christmas scenes from current work or draft original stories. It was a great success. So if you've a mind for some awesome Christmas shorts, check the Writer's Grapevine archives for December 2011. I’d like for you to meet two characters from Kaitlin’s Silver Lining who have now grown into young adults. Pete Hart was fourteen when Charley Kanatzer was eleven, but Charley is on her way home from a fancy school in Boston and makes a stop at Bryce Stanton’s family home in Brownwood. With nowhere else to go, Pete found his way to the Stanton ranch and is now foreman, and though he still has inner demons to wrestle, he’s content if not happy. But Charley wants more and starts a stampede on his emotions. Pete was pitching hay into the back of wagon, and Charley took a moment to appreciate the fluid way his lanky but powerful body moved. He shot a wary glance at her approach but continued to work. He paused for a moment before returning to his work. The worn felt hat shadowed his face, so Charley had no idea what emotions her comment had elicited, but by the way his hands gripped the handle tighter, she figured she must have hit a nerve. He stopped and wiped his forehead with the back of his gloved hand. His silence was not inviting, but she plowed on anyway. “I’ll have Blake do it.” He pushed his hat back, and his striking features arrested her attention. Dark brown hair fell across his forehead in a tangle of waves. High cheekbones and a broad nose hinted at Indian blood somewhere in his lineage. He narrowed his blue eyes and looked as if he meant to protest, but William chose that moment to ride into the yard and into their conversation. “Goodness, Uncle Will, you look cold to the bone.” Her own cheeks felt blustery from the winter chill. The cold front had brought rain and biting temperatures but little else. With Christmas only five days away, she hoped it would snow. “I hate the cold. You about done, Pete?” Will asked after dismounting. Pete did not look happy with the order but couldn’t refuse the boss’s wishes. Steam left his lips as he heaved a great sigh. Without much talk, he gathered supplies, hitched another wagon, and clamored into the seat. “Climb in,” he ordered. He jumped from his perch and roughly helped her onto the hard, wood seat. She adjusted her coat and folded her gloved hands into her lap. After rearranging the scarf about her throat, she was ready to go. They found a patch of forest that looked promising, and Pete set the brake. He even remembered to help her down. She lamented the need for gloves, for she would have enjoyed feeling his touch. The elm and oak had all lost their leaves and looked like skeletons against the harsh blue sky, but after hearing the stories of the Christmases she’d enjoyed in the northeast, Will’s children had wanted a tree. With enough decoration, bare limbs could come alive with color and symbolic meaning. His gruff voice spoke of a deep hurt, one that only time could heal. She understood, had singled him out for that very reason. She’d overheard Bryce talk about Pete with her Aunt Kaitlin and knew she had to find him, to heal the wounds in his soul. In so doing, she could come to grips with her own tainted childhood. They had a lot in common. He’d been abused as a youngster, and she’d grown up in a brothel. And both owed the Stantons the world for changing their destinies. “I – I know most men don’t want the daughter of a calico queen for a wife.” There, she’d finally put into words the pain she endured the moment a prospective beau found out her past. Oh, they might be willing to overlook her upbringing in light of Bryce’s wealth, but once she’d seen that look in their eyes, she knew they could never love her for herself. “Why me?” His voice broke. She’d touched his heart with her confession. “Because the reasons you don’t want me have nothing to do with my past and everything to do with yours.” She stepped closer. To find out more about Pete's sordid past or Charly's background, grab a copy of Kaitlin's Silver Lining. So today is going to be a writing day. It's been raining hard since 2:00 PM yesterday which makes for perfect writing weather. After all, what else is there to do, right? So now comes the hard part. I want to work on them all and my mind is churning but I'm not magic like some of my characters. I have to settle for one for today. Ugh, why do I do this to myself. The logical thing would be to work on the one that's closest to completion but I have a research trip planned this summer that will help immensely on it so I feel I need to wait so I'm not doing a ton of rewrites. The next logical choice would be the one that's next in terms of completion. Hmm or maybe the Christmas story since I'm feeling in the mood. Yep, I'm guesting again on Susan Leigh Noble's blog. You can find out all about how I write and other tidbits about my newest release, The Rose Hunter. Please come visit. Don't be shy and leave a comment while you're there. And while you're there, take a gander at Susan's work as well. I love that she's a cat lover and lives in Texas. A kindred spirit for sure. Can you tell I'm really excited this book is finally out? In the meantime, here's the story that started this series. My crit group at the time was challenging each other to write shorts. It might have been for a contest. I can't remember now. While the story isn't as polish, having been written over ten years ago, it showcases Sir Villdemore and his lady wife, Siphinea. Both characters make an appearance in both The Keeper of Moon Haven and The Rose Hunter. After writing this short story, the idea for The Keeper of Moon Haven was born and with it the idea for the series revolving around Alfheim Haven and the Blue Moon. Horatio Villdemore, former Ealdorman of Lockenworth, growled deep in his throat. Simon gave him a perplexed look before casting a heavy sigh. Horatio rolled his eyes. “The king will no’ be happy.” Simon dogged his steps. Horatio continued to stroll toward his damp habitat. The lantern he held illuminated a large, roomy cavern surrounded by stalagmites and stalactites. Moisture clung to his fur, a phenomena he usually paid little heed to. Today, however, he felt melancholy, and the droplets of water became an annoying reminder of what he’d become. “Forsooth, thou tryeth my patience. I tried once to force a woman to love me by mixing a potion. She came upon me and realized my nefarious intent at the exact moment the egg of Liestra hatched. Thou seeth before thee the result of such folly. I shalt ne’er use force again upon a woman. I canst not and wilt not obey the king. I have had three hundred years to think of the past. If I die tomorrow, so be it.” He turned his back, dismissing Simon with his actions. Horatio stood still and perked his own ears. 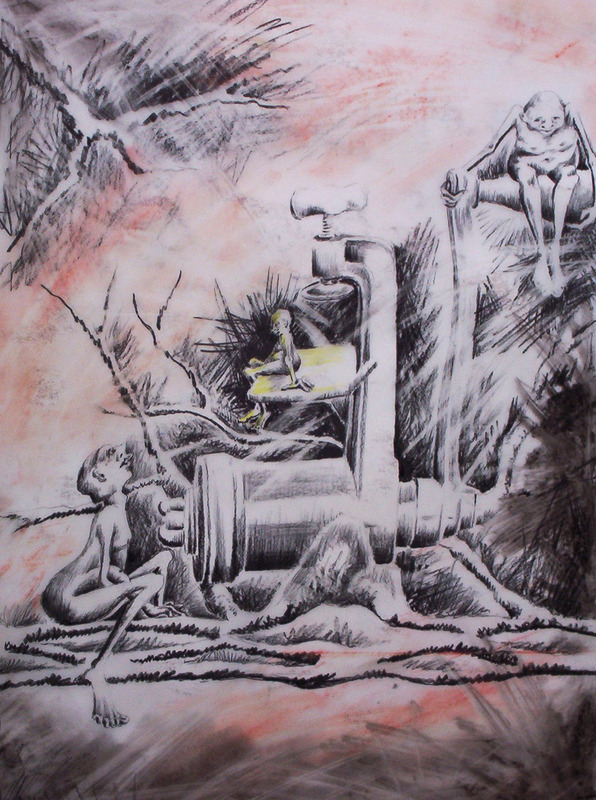 He heard nothing save the trickle of water that fell from nearby stalactites. At Simon’s words, Horatio gritted his teeth. Without waiting to see if Simon followed, he hurried to the spot. He had no wish to see another crumpled body upon the cold stone floor. Horatio rushed to save another poor soul, not knowing Siphinea Raven had fled into the night, her bare feet flying across the harsh terrain, not knowing his fate had caught him. The dogs yelped louder, their incessant baying enough to wake the dead. Fire exploded within Siphinea’s chest. Her breath came short and fast. Cramps attacked her legs as she forced them to move faster. The Wild Hunt continued and she was the Sluagh’s prey. She glanced over her shoulder to gauge the distance between herself and the Sluagh. Her legs caught in her flowing skirt. Tripping, she fell forward. Her arms flew out to catch herself and found nothing but air. She screamed. Loud and hard. The sensation of falling caught her unawares. Darkness enveloped her descent into a gaping void. A hole. She’d stumbled into a hole. She continued to verbalize her fear, the sound echoing off the damp, musty walls. Volumes of material billowed about her. Fresh flowers woven with care flew from her hair. Seconds turned into minutes. Death approached. The jaws of Hell loomed before her, its mouth a gaping pit of darkness. Knowing all was lost, she closed her eyes. Resigned to death, she floated on a cushion of air, weightless, buoyant. Ooomph! She landed on an unexpected pillow of warmth. Arms cradled her against a soft, downy chest. A musky odor tantalized her senses. Dead? She had felt no pain. Slowly, almost fearful, she opened her eyes. She blinked. A face covered in hair the shade and texture of a lion’s mane gazed down upon her. She filled her lungs with gulps of air. Hell had claimed her for sure. The creature growled, a low snarl that caused her scalp to tingle. Her arms pushed against leather skin. It held her tight. “Ow!” The creature dropped her and rubbed the spot where a clump of hair once grew. Her bottom connected with hard ground, bruising her tender skin. Her eyes lifted to the creature’s. Its massive physique loomed above and it peered down at her with beady, green eyes. Lantern light cast a soft, orange glow upon its apelike features. “The top-sider does no’ appreciate yer chivalry, Sir Villdemore,” a voice from the darkness mocked. A troll? She’d landed in a den of trolls? She scrambled backwards, her fear greater now than anything she’d experienced before the fall. Even the Sluagh, the outcasts of the Faery community with their forbidding nature, seemed preferable to the troll she now faced. “She’s a pretty thing for a top-sider.” The gnome creature loped forward. Top-sider? Did they think her human? She frowned. They couldn’t see her pointed ears for the long hair that had been loosened in the fall. The beast crouched down in front of her. It reached out to touch her cheek. She strained away. It wouldn’t be deterred, and the soft pad of its finger grazed her skin. Gentle. The tender caress of its feather light touch settled her nerves. What magic did this abomination have over her? The deep, rich timbre of its voice marked it as male. And he spoke English with civilized articulation. Could he be harmless? She adjusted to his odd looks, deciding his soothing voice and kind words marked him as tame. And – he had saved her life. She glanced around her winsome surroundings. Walls of tiny crystal particles glimmered in the soft light. Tapered fingers of layered minerals grew from ceiling to floor. Such visual delight could not possibly decorate the walls of Hell. She nodded. He pulled away abruptly, his manner tense, agitated. “You hath knowledge of me?” Her curiosity transcended her fear. “Bride?” Trolls were known to take human wives, but she’d never heard of them taking an Elfen bride. “Female trolls art unable to breed children. 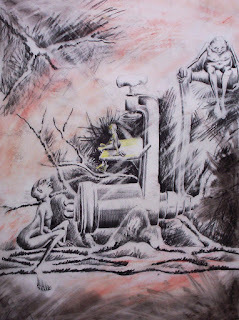 Therefore, male trolls steal human females for their mates.” He explained as if she had no knowledge of such practices. “Thou jests!” She backed away, horrified by his statement. A shiver of excitement slithered up her spine. She ignored his question. She’d escaped one beast only to find another. Where was her fear, her revulsion? She felt drawn to the gentleness in his eyes as if she could see past his fangs and pointed ears. His lascivious grin caused her to pull away. She needed time to think, to evaluate her situation. Her mind became a tangled web of thought. She tried to recall what she knew of trolls. When very little information wiggled from her memory, she tried to think of questions she might put to the beast. The heat of his gaze swept her from head to toe. He circled her, studying her as if she were the oddity. “This place? How far did I fall?” She moistened dry lips with the tip of her tongue. She shivered, remembering her harried run through the forest. His green eyes deepened, penetrating her soul. She felt his strength of character, his noble desire to help others. She shuddered as conflicting emotions converged. Trolls were supposedly hideous creatures, reeking havoc on the unsuspecting. Sir Villdemore seemed different. She took a step closer. Could this beast offer her sanctuary from her preordained future? She smiled at the irony of this thought. The troll had meant to kidnap her, hadn’t he? “I return you topside where thou shalt go about your business.” A sadness crept into his voice. She sensed his deep loneliness. She’d never heard of a troll relinquishing a captive. Could she trust him? From the villagers, she’d often heard stories of young maidens being carried off into the night. Her heart softened towards him. How odd. Elves normally did not feel such strong emotions unless their hearts became touched by the goodness of another. Marriage. She’d run from home tonight to escape an unwanted betrothal. Her father had offered her to Lundro, a dark Jotun giant with a soul as black as Loki’s. She suspected Lundro of setting the Sluagh on her heels. A choice. She had a choice. Marry the monster hidden within the man or marry a man buried within the monster. She reached out a hand and centered it upon his chest. His heart accelerated from her boldness. Her eyes met his. He’d been nothing but kind in his dealings with her. “Thou hath no idea what you say, lass.” He narrowed his eyes to slits and his nostrils flared wide. Silence stretched forward, dark and menacing. He didn’t seem happy with her offer. Had she read him wrong? His hand reached out. Long, sharp fingernails lightly grazed the side of her cheek. She closed her eyes. He won’t hurt me. He’s not like other trolls. Calloused fingers took her by the arm, meaning to lead her away. She balked. Without a stolen bride, the king would kill him. His life force felt warm and vibrant upon her arm. Suddenly, she couldn’t bear the thought of his death. Whether he agreed or not, he needed her. Certain of the course she must take, she pulled her arm free. He lowered his lips upon hers, his desire hungry and bruising. Both repulsed and intrigued, she froze. He means to frighten me away. She absorbed the feel of his body against hers, heard the erratic beat of his heart. She tasted his passion. How could something so heady not be right? Her body melted against his, drinking in the unfamiliar emotions his kiss evoked. Confusion gripped her. Did he now agree with her plan? She started to speak, but the king cut her off. “Pretty and young. I might change my mind and marry you myself.” The king lowered his shaggy head and sniffed. A dark red tongue snaked out over his full lips. She shuddered. “I want to go home now.” Her voice sounded weak even to her ears. She had no wish to remain in this particular troll’s company. Stepping into Sir Villdemore’s embrace, she nestled against his warmth. She wanted him to take her away from the king’s menacing presence. Confusion made her strain against the arms that held her. “Let me go.” She wanted to see his face. At that moment she understood clearly what transpired. A troll’s code of honor must only allow unwilling maidens to become wives. Sir Villdemore wanted her cooperation, so the king would shun the union, forcing Sir Villdemore to return her topside. The crafty troll sought a way out as a means of saving her from himself. He didn’t understand her alternative frightened her more. For good measure, Siphinea screamed and fainted to the ground. She heard the king’s laughter echo along the corridors as he left her alone with Sir Villdemore. Her gaze dropped to his overlarge feet. She hadn’t really thought past saving herself from Lundro’s clutches and preventing Sir Villdemore’s death. More importantly; wed to a troll. No, not a troll. Sir Villdemore had once been a man, and by all she’d seen and heard, a proud man. And so it came to pass that Siphinea Raven married a hideous beast, overlooking his outer image and searching her heart for the true beauty within. Wow! 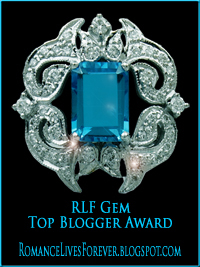 Just found out I was one of the top five bloggers for my November guest post at Romance Lives Forever blog. Way cool but I couldn't have done it without my friends and fans visiting to read about The Rose Hunter's release. You all rock!!!! Guest blogging is a great way to get information about a new release out and about. Some blogs have more traffic than others but it's always a win-win for both the blog host and the guest. Don't forget to visit my current guest post at RFL. Lyerra's in rare form as she reveals her most inner thoughts. Lyerra Ahdia from my newest release was interviewed on the Romance Lives Forever blog. She's really excited about the post. Being thrust into the human world wasn't easy for the elfin witch, but she's adapting and wanted everyone to hear her story. I invite you to read her interview at RLF. Lucian Willshire is plagued by thoughts of a fey world and the disappearance of his aunt some nineteen years past, but when his friend drags him back to Hamingjur Castle, he stumbles into Alfheim Haven once more where mystical beings become more than a distant memory. “You plan to have the babe out of wedlock?” Kane scratched his head. Her foot caught a gopher hole, and she tripped, falling headlong onto the hard ground. She cried out when her elbow kissed the ground. She groaned and rolled to her knees. Every joint ached. Twigs and grass stuck to her dress, and she brushed them away with sore hands. She moaned at the pain and glared at her scraped skin. Her shout brought the attentions of his workers. Seventeen sets of eyes peered down at her, and the heat rose to her cheeks. I love writing. I love creating stories that tease the imagination and hopefully come alive for the reader, but I write slow. I can offer a lot of excuses but some are very legitimate, and I think buried in all of these reasons there might be sound advice for others with this snail problem. First, I get bogged down in research. I'm always questioning myself when it comes to historical references. So, while I'm working on the next sequel to The Rose Hunter, I find myself once again searching for those details that will make the book resonate, will make the book believable. The problem is that there are a lot of details that could be included. The story will begin in 1213 AD (Oh wait, that's not kosher any more. I should have said 1213 CE but when I write the story I will use AD because that's how they would have referred to it.) I digress. My best advice to you as you research is to keep it simple. Truly, you don't have to include all that happened in a given year or time period. Find something that will accent your story and give it flavor without overwhelming the setting you've chosen. Or perhaps, a main historical event is the backdrop for your story. Once again, see what you can do to narrow it down. Think about the civil war for example. A lot of battles were fought, a lot of political intrigue took place. You don't have to include it all. Second for me is time management. I work a full time job plus. I teach so my forty hour work week is typically at least a 50 hour work week or more. I live in the country where my husband and I are finishing out another cabin so the weekends include helping him do things like staple up insulation (that's what I did yesterday). Then of course, time has to be set aside for the mundane things like cooking, cleaning and other chores. But I had someone trying to teach me guitar one time and he had something very profound to tell me. He said, "Practice everyday, even is you only play one chord for a split second. The trick is to put that guitar in your hands everyday." Writing is the same way so I try hard to open up the manuscript and write each day even if all I eek out is one sentence because at the end of the day, I'm one sentence closer to finishing the book. Another setback for me is my darn internal editor. Try as I might, I can't seem to turn off the internal editor as I'm writing. This really slows things down. On the other hand, my rewrites aren't as extensive as they would be if I just wrote without editing. My writing habit also slows me down. I don't outline. I'm a pantser. I can have a great day where I draft a whole chapter without blinking an eye but as a pantser, I tend to write myself into corners. That ending hook is great but then where will it lead me? So then, it's stewing time. I have to let the idea percolate. In some cases, like this last book, the idea brewed for six months before I settled on a direction that was plausible. Yeah, I should outline but the reason I write by the seat of my pants is so I don't get bored. If I know the ending already, I'm less likely to finish the book. I want to be just as surprised as the reader. My vivid imagination doesn't help either. I tend to have more than one project going at a time. At present I have three books in the works. (Well actually five, but two have been rather dormant so we won't count them). I'll write on one until I hit a roadblock then go to another. The problem with this is remembering what I wrote when I come back to a storyline I've let sit for a while. To help, I try to have an ongoing outline for each story. As I write the chapters, I try to outline the main ideas. I still have to reread just to get back into the book but the outline does help keep facts straight. And last, but not least, there's the physical aspect of writing. My eyes get tired. There are some days I just don't want to turn on the computer. There's nothing I can do about this except give my eyes a break now and again. Don't sit at the computer at long periods of time without getting up and moving around. It's not healthy for your eyes or your body. So - I tend to write for 15 - 30 minutes and then force myself to get up and take a walk. I have the most fabulous place to take a walk so really, it's not an imposition to move away from my desk. 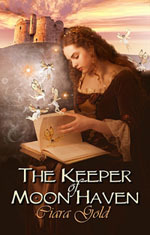 Today's snippet is from The Keeper of Moon Haven, the first book in the Blue Moon Series. It was all about the gold. With the book, she had a veritable fortune at her fingertips. No wonder Lord Somerton had taken exception to the book’s disappearance. He must have summoned Surt on several occasions, knowing the gnome would be honor bound to gift anyone who asked with a portion of gold. Her morals wouldn’t allow her to take the money, and even though the grumpy gnome might be willing to give her the precious metal, she knew in her heart, it amounted to nothing more than stealing. As desperate as she was to travel to America and join her sister, using the book wasn’t the way. She couldn’t steal Surt’s gold. Both The Keeper of Moon Haven and The Rose Hunter can be found at Amazon, All Ebook Romance and Champagne Books. RLF great for promotion! And chance to receive a kindle copy. Romance Lives Forever is a great site for helping get the word out about your books. 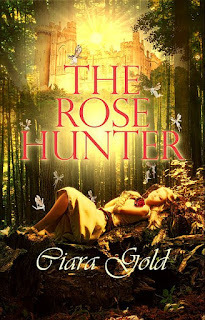 Today, I'm excited to be talking up my newest release, The Rose Hunter. I would love for you to visit and check out the site, both for my book and to see what a great place it is to visit or schedule your own guest blog. I think in this overwhelming digital age, it's especially difficult for new authors to break into the market. One of the best ways is to guest blog. Hopefully, that blog's readership will take a gander at what you have to offer and learn more about you and your book but your own readership will hopefully follow you to that blog and find other authors they want to read. It's a win win! If you comment on my guest post and leave me your e-mail address, I will gift you a free kindle copy. If you've already read, the Rose Hunter (then I thank you kindly), I will gift you a kindle copy of another of my books. There are 14 in all. You might want to start with The Keeper of Moon Haven as it precedes this current book. The Rose Hunter is here! Today is the big day! The Rose Hunter is now available for purchase through Champagne Books, Amazon, Barnes and Noble, Kobo and All Romance Ebooks. “Lyerra, I …” The deep timbre of his voice sent tingles down her spine. Gearing up for Release Day! Tomorrow is the big day! The Rose Hunter will be available for purchase through Champagne Books, Amazon, Barnes and Noble, Kobo and All Romance Ebooks. I'm so excited about this story and being able to share it with readers. I love taking characters from another story who might have been a wee bit hard to love and giving them their own story. It's fun finding ways to redeem them. For this story, it was Lyerra from The Keeper of Moon Haven. It wasn't that she was horrible or anything, but she was a bit loose with her affections. That's because she was an elfin witch and commitment wasn't in her vocabulary. In The Rose Hunter, things change. She's struck with what other elves in her coven term as "the change". No longer is she content to live life one day at a time. Instead, the change is interfering with her emotions and stripping her of her powers. One day she's able to heal with just her touch and the next she's lost this ability. Finding a cure involves hunting the elusive Rose, an item of great worth that was stolen from Alfheim Haven years ago by her own mother. Unfortunately, her search will take her out of the safety of Alfheim Haven and into the human realm. Her story if one of sacrifice, of trials contrary to who and what she is, but the end result will have her finding true love. Yep, I'm a sucker for the HEA (happy ever after) endings. 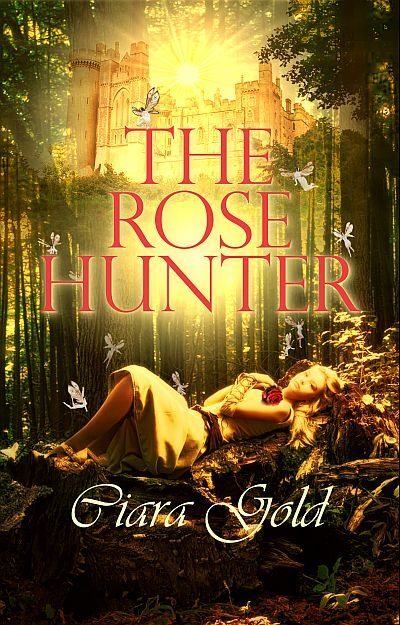 So - in preparation for the release of The Rose Hunter, I've scheduled a few ads here and there and a few blog spots. I would love for you to check out the guest blogs. Sept 9 - I had a wonderful interview on Katrina Marie's blog. You can read it here. Nov 2 - There will be a Release Day Announcement on Books Glorious Books, Sue Horsnell's blog. Nov 8 - I have a wonderful interview/announcement on Romance Lives Forever blog. Dec 2 - Another lovely blog post on Romance Lives Forever blog. Dec 11 - I have a featured author spot on Susan Noble's blog. Would love for you all to pop in and visit some of these great places.